My maternal grandparents —Gaetano Spera and Antoinetta Pizzichillo — immigrated from Potenza, Basilicata, Italy, on separate ships in 1906 and 1912. They were married in 1913 so I requested a copy of their marriage license application from the Denver Public Library’s Western History/Genealogy collections. After reading through the document, something caught my eye: the court clerk recorded Gaetano Spera’s name as “Kate” and made him the bride, while Antoinetta was the recorded as the groom. I thought, well, there must have been some language misunderstandings going on. Both people were recent Italian immigrants and did not have a good grasp of the English language. Last night I was doing some random searches in the Denver Post archives looking for some other “Spera” family articles, and I came across an article from 10 December 1913 in the Denver Post. Just a point of historical context, the court clerk, Benjamin Stapleton, who adjudicated the issue, and got into a heated argument with Gaetano, was elected mayor of Denver in 1923 with Ku Klux Klan support. The governor at the time, Clarence J Morley, was also a member, as well as the Denver Police Chief. The Klan was ascendant in Colorado during the 1920’s and thankfully was fought back. City and County of Denver, Colorado, Application for Marriage License, no. 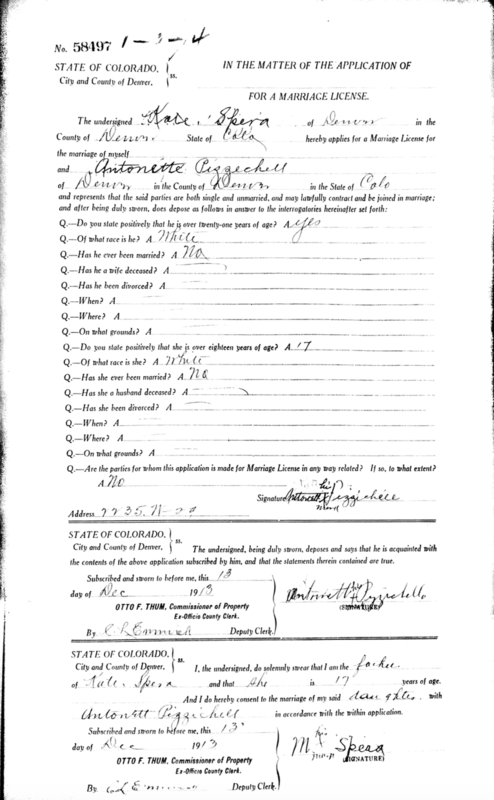 58497, for “Kate” Spera and Antonette Pizzichillo, 1913; “Marriage License Applications, 1903-2004, from Denver Public Library, Western History/Genealogy. Wikipedia (https://en.wikipedia.org/wiki/Benjamin_F._Stapleton), “Benjamin Stapleton,” rev. 22:38, 4 February 2018‎. Denver (Co.) Post, 14 December 1913, 10.